(1) In Senate, George O. Nokes, Jr., in special election 11/6/1949, sworn 1/31/1950, succeeded James E. Taylor, resigned 8/31/1949. In House, James C. Sewell, in special election 11/8/1949, sworn 1/31/1950, succeeded George O. Nokes, Jr., resigned 8/27/1949. Members of the Texas Congress 1836-1845; Members of the Texas Legislature 1846-2004, 2005. (2) Taylor resigned 8/15/1949. Texas Legislative Manual. 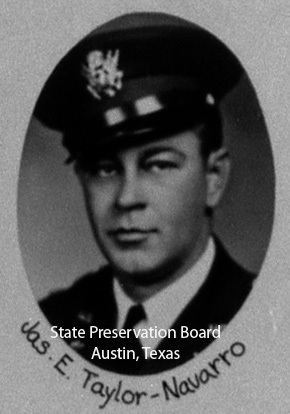 (3) James E. Taylor, in special election 11/7/1944, succeeded Clay Cotten, died 8/16/1944. Members of the Texas Congress 1836-1845; Members of the Texas Legislature 1846-2004, 2005. Biographical sketch, Brigadier General James E. Taylor. Legislative Reference Library. United States Army, Lieutenant Colonel, World War II. "Two former Texas National Guardsmen who were members of the Texas House of Representatives have risen to the rank of Lieutenant Colonel in overseas activities with the American forces. James Taylor of Kerens and John M. Mohrmann of Gonzales both wear silver leaves to designate their present rank." "Officials Get High Ranks," 8/31/1944, p. 4. Lubbock Morning Avalanche. Pictured in uniform in the 49th Senate composite photo and listed as Lt. Col. James E. Taylor. Pictured in uniform in the 47th House composite photo. State Preservation Board. United States Army, Lieutenant Colonel, Major General. Texas National Guard. 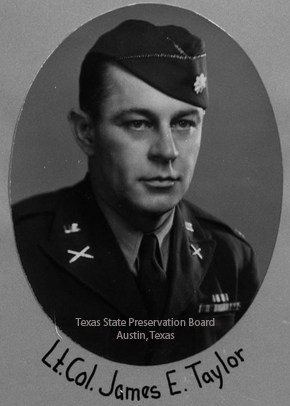 Biographical sketch includes full description of World War II and Texas National Guard service, including awards of the Silver Star, the Bronze Star, and the French Croix de Guerre. Inscription on back of headstone: Major General, United States Army. Commanding General, Texas 36th Division Field Artillery. Awarded Silver Star in September, 1943 for Gallantry in Action. Awarded Bronze Star in August, 1944 for Heroism in Ground Combat. Awarded the French Croix De Guerre. Mayor, Kerns, Texas. Member, Texas House of Representatives from 1939 to 1942. Senator, Texas Senate from 1945 to 1949. Chairman, Gilmer-Aiken "Citizens Committee on Education." Adjutant General of Texas, 1961. Texas State Cemetery. Describes Senator Taylor's involvement in the political and legislative processes through which the Gilmer-Aikins bills became law. Includes senator's article "Texas Moves Forward in Education" reprinted from State Government, January 1950. Gilmer-Aikin Bills: a Study in the Legislative Process, 1950. Letter from Major James E. Taylor to Walter H. Beck, 3/2/1944, describing the services of the Texas National Guard unit in Italy during World War II. Vol. 48, No. 2, October 1944, Texas Collection, pp. 281-285. Southwestern Historical Quarterly. Taylor, James Edward. Texas State Cemetery.